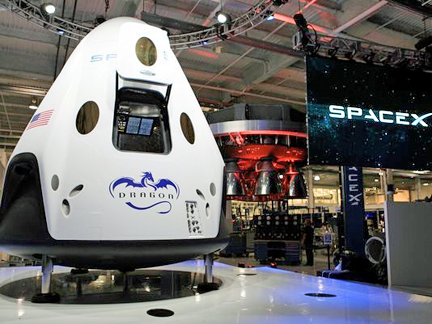 SpaceX mockup of the company's Crew Dragon capsule. Photo is courtesy of NASA/Dimitri Gerondidakis. In a sign that astronaut launches from Florida are growing nearer, SpaceX recently leased an Air Force facility where the company will prepare Dragon capsules to fly crews to the International Space Station (ISS), this according to a new posting at the Florida Today infosite, authored by James Dean. The U.S.A.F. 's 45th Space Wing said work on the capsule called Crew Dragon, or Dragon 2, would take place in Area 59, a former satellite processing facility on Cape Canaveral Air Force Station. According to reporter Dean, it's unclear when SpaceX or Boeing will be ready to launch test flights of astronauts under NASA contracts. The most recent public schedules show unmanned test flights of SpaceX’s Dragon in April and Boeing’s Starliner in August. Test flights with two-person crews would follow in August and November, respectively. Those dates, however, are considered optimistic and likely to slip, maybe even to 2019. Until then, NASA will continue to rely exclusively on Russian Soyuz spacecraft to ferry astronauts to and from the ISS, as it has since the space agency retired the shuttle program in July 2011. A Global Positioning System satellite launched in early 2016 was the last spacecraft the Air Force readied for flight at Area 59, located near the Skid Strip south of Cape Canaveral Air Force Station’s Industrial Area. On December 15, 2017, a Falcon 9 launched a cargo version of the Dragon to the ISS for the 13th time under a NASA resupply contract. That Dragon is targeting a January 13 return to Earth with a Pacific Ocean splashdown.